Turkish President Recep Tayyip Erdogan’s ongoing military purge is not merely a response to a coup, but an aggressive restructure, rebranding, and reorientation of the Turkish military. Erdogan began to purge the Turkish Armed Forces (TSK) after elements of it launched an unsuccessful coup attempt on July 15, 2016. Turkish security forces detained nearly 10,000 service members including 143 general officers and admirals in the first week, totaling over 1/3 of the officer corps. Erdogan justified his crackdown on a counterterrorism basis, claiming to remove members of exiled cleric Fetullah Gulen’s movement, which Turkish authorities have designated as the “Fetullah Terrorist Organization (FETO).” He has also dismissed, and in some cases arrested, tens of thousands of judges, civil society members, and academics, and he closed down dozens of newspapers. The extent of Erdogan’s purge and his use of a counterterrorism justification demonstrate his intent to use the coup attempt as an excuse to transform the Turkish military into a source of personal power and eliminate sources of dissent in Turkey. The current military purge is part of an ongoing campaign by Erdogan to eliminate threats to his Islamist regime. The Turkish military historically has a secular culture and views itself as a protector of the post-Ataturk democratic society. Erdogan thus views the military as a threat to his vision of an Islamist autocracy and has taken steps to eliminate it since 2007. He dismissed 400 Turkish officers including 37 generals and admirals in response to alleged coup conspiracies between 2007 and 2010, prompting the resignation of the Chief of the General Staff and the Commanders of the Turkish Navy, Land Force, and Air Force. About half of the Brigadier Generals and Rear Admirals removed this month were promoted to their rank after the initial purges. Erdogan’s aggressive measures after the recent failed coup attempt indicates that he likely seeks to finish his long-time campaign through this final purge. 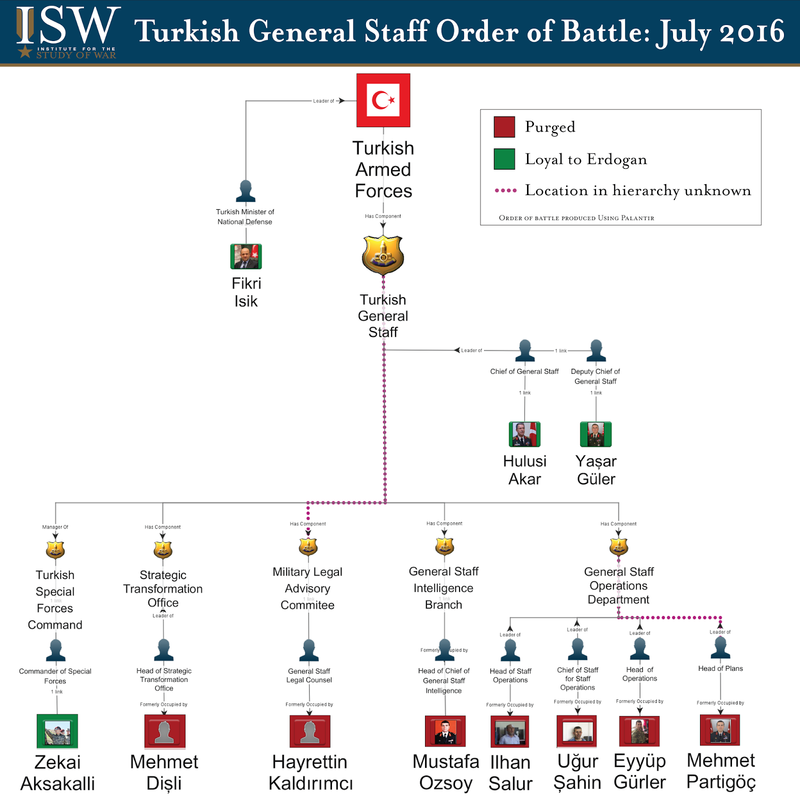 Erdogan’s purge targeted a wide swath of the TSK leadership. He used the justification of alleged membership of individual commanders to the alleged FETO rather than direct participation in the coup attempt itself. The main units that participated in the coup attempt were the Istanbul Gendarmerie, the Istanbul-based 1st Army 3rd Corps, the Ankara-based 2nd Army 4th Corps, the 4th Main Jet Base group at Akinci, and the 10th Tanker regiment at the Incirlik Airbase in Adana. Erdogan nonetheless extended his purge throughout non-combat units that did not appear to play a direct role in the coup attempt.. He purged the General Staff, the Training and Doctrine Command, and Turkey’s military and police intelligence community, which he condemned for “significant gaps and deficiencies” in failing to prevent the coup attempt. Erdogan’s purge centralizes his authority, removes internal resistance, and takes control of the training programs for young military officers in order to retain control of the TSK’s future. Erdogan is centralizing his control over a new national security apparatus as he consolidates. He stated in his first interview after the coup attempt: “a new structure will be emerging. With this new structure, I believe the armed forces will get fresh blood.” Turkish Prime Minister Yildrum later provided additional details, stating: “There are problems in [the] hierarchy between lower level and senior level [officials.] We will restructure [the army] in a manner that will resolve these problems.” His statement indicates that Erdogan will collapse some command echelons in order to ensure that the culture and ideology at the now-loyal senior officer ranks diffuses throughout the entire force. A Turkish parliamentary official reported that Erdogan intends to transfer control of the General Staff and MIT from the Prime Minister’s office to his own, which would provide Erdogan with direct operational control over the TSK and Turkey’s intelligence establishment. The move requires parliamentary approval, which he will almost certainly receive. He is also empowering the Turkish police, which played a major role halting the coup attempt. Turkish Interior Minister Efkan Ala announced that Turkish police will be equipped with heavy weapons on July 28. The strengthening of the Turkish Police is likely a mechanism to balance the strength of the Turkish Gendarmerie, elements of which participated in the coup attempt. · Commander of the Ankara Gendarmerie Ferdi Korkmaz. Erdogan’s purge affects the American military relationship with Turkey. In the short term, the TSK will have limited ability to conduct military operations as Erdogan completes his purge and restructure. Former NATO Supreme Allied Commander General James Stravridis said Erdogan’s purge is having a “chilling effect” on the TSK, stating, “there will be a strong negative impact on the ability of the Turkish military to perform its duties across the spectrum of alliance activities.” Previous options in the anti-ISIS fight such as deploying large numbers of TSK to shut down the Syrian-Turkish border are likely now unviable in the short term, even if Erdogan wanted to undertake them. Erdogan’s consolidation of personal power and removal of the TSK’s secular culture will likely also have long-term implications for Turkish-American military relations. 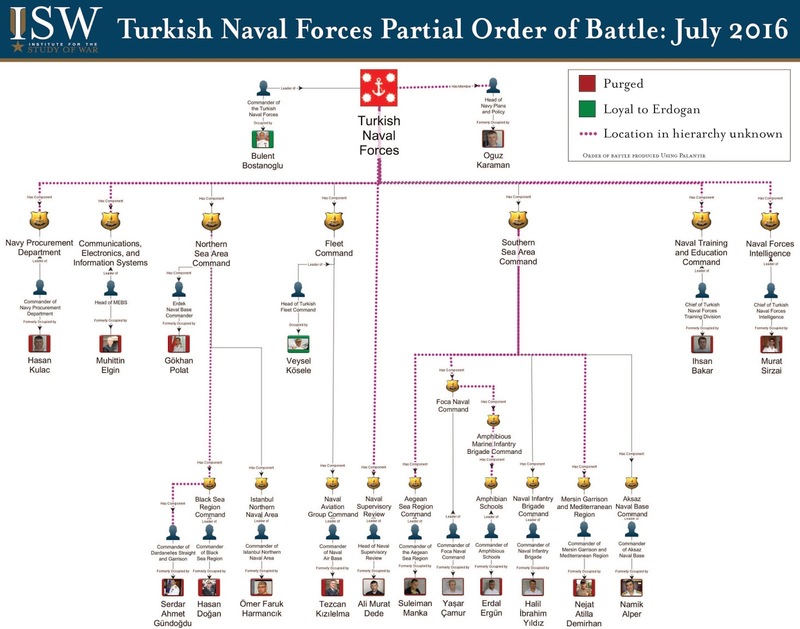 This report will present a partial assessment of the Turkish Order of Battle prior to the coup based upon the rank and position of general officers and admirals that either remained loyal to Erdogan during the coup attempt (highlighted in green) or that were purged in the first week after the coup attempt (highlighted in red). 1st Army (Istanbul). The 1st Army is headquartered in Istanbul with units stationed along Turkey’s borders with Greece and Bulgaria. 1st Army Commander General Umit Dundar was critical to Erdogan’s victory over the coup attempt. He warned Erdogan of the coup early enough to enable Erdogan to escape detention. He later appeared on television to declare the coup illegitimate, projecting a source of strength and anti-coup sentiment that fueled anti-coup protests. He then led police and civilians to retake the Ataturk International Airport. The 5th Corps’ 54th Mechanized Infantry Brigade is headquartered in Erdine and stationed along Turkey’s borders with Greece and Bulgaria. Turkish security forces arrested its commander, Brigadier General Hidayet Ari Erdine. The 1st Army also includes the Izmir-based 3rd Corps, currently designated as the NATO Response Force –Turkey. Numerous 3rd Corps units participated in the coup attempt. Turkish security forces arrested 3rd Corps Commander Lieutenant General Erdal Ozturk, although his exact role in the coup attempt is unclear. The 52nd Tactical Armored Division’s 66th Mechanized Infantry Brigade, based in Hasdal Istanbul, participated in the seizure of the Ataturk Airport. Turkish security forces arrested its commander Brigadier General Mehmet Nail Yiğit. 2nd Army (Malatya). The 2nd Army is headquartered in Malataya with units stationed along Turkey’s borders with Syria, Iraq, and Iran. It is Turkey’s second largest land formation at 100,000 troops, including three corps. The 2nd Army is the ostensible “invasion force” - Erdogan would use it in a military intervention into Syria, but had objected to proposals for intervention in the past. It played a large role in anti-PKK operations in southeastern Syria. Turkish security forces arrested 2nd Army Commander General Adem Huduti and Chief of Staff Avni Angun along with most of the commanding officers in the Diyarbakir-based 7th Corps, including three mechanized units. Erdogan’s purge of the 2nd Army may make it more amenable for use in Syria in the future. Alternately, the purge could neuter the 2nd Army, requiring Erdogan to consider other options for influence in Syria. An alliance with Syrian Salafi-jihadi groups is one possibility, as a previous ISW report examined. 3rd Army (Erzincan). 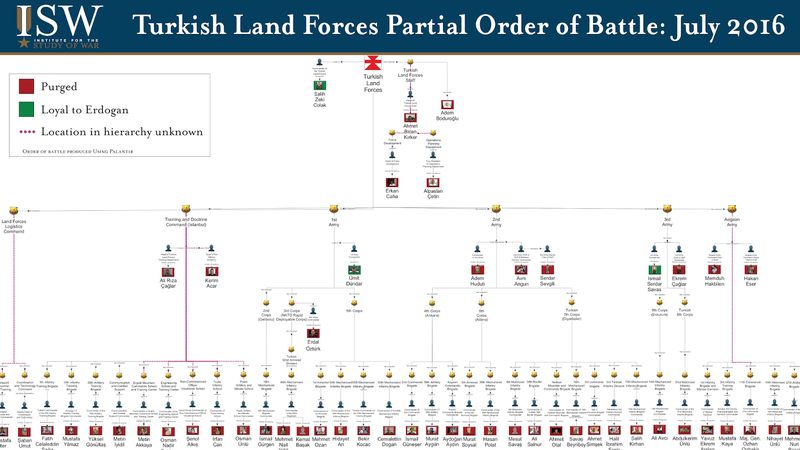 The 3rd Army is the largest Turkish land formation. It is headquartered in Erzincan with units stationed along Turkey’s borders with Armenia and Georgia. 3rd Army Commander Ismail Serdar Savas remained loyal to Erdogan during the coup attempt. 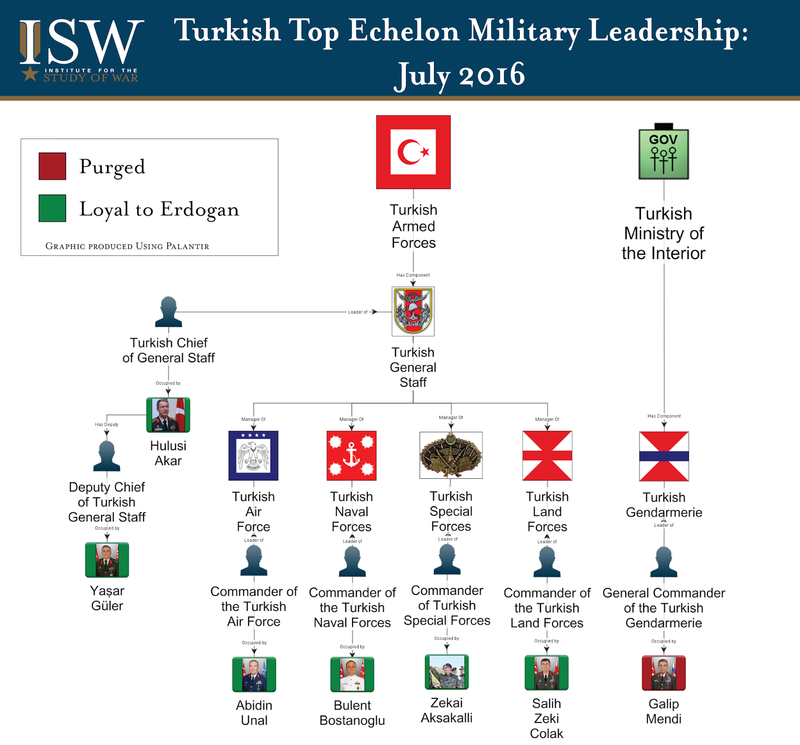 The purge left the 3rd Army’s leadership largely intact, possibly indicating its loyalty to Erdogan. Aegean Army Command (4th Army) (İzmir). The Aegean Army Command is headquartered at Izmir with units stationed along the west coast of the Anatolia peninsula. It consists primarily of training brigades and the Cyprus Turkish Peace Force. Turkish authorities arrested its Chief of Staff Mehmduh Hakbilen and Deputy Chief of Staff Hakan Eser during the purge. The military requirements of allied NATO nations has not deterred Erdogan’s purge. Erdogan has eliminated numerous Turkish generals serving in positions for NATO, demonstrating a newfound defiance. Erdogan’s disruption of NATO could simply be an unhindered extension of his aggressive purge. Alternatively, he could be setting conditions to break with NATO by drawing back Turkey’s role. 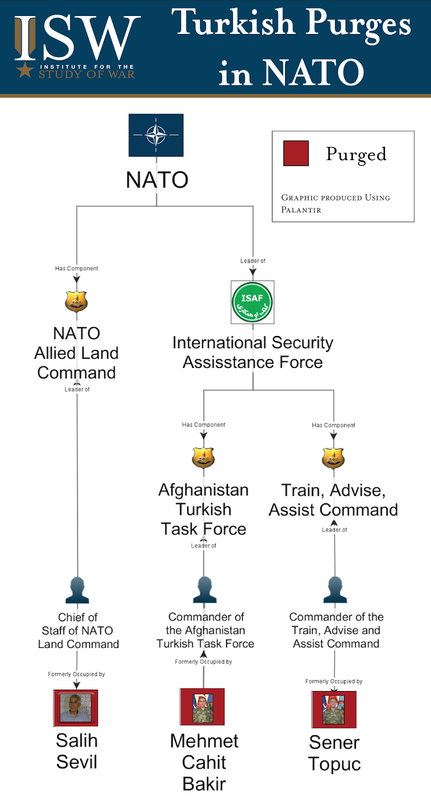 NATO’s Allied Land Command (LANDCOM) is based in Izmir alongside the Aegean Army. Its duties include serving as the “headquarters element responsible for the conduct of land operations and the synchronization of land forces command and control (C2)” for NATO operations. Turkish authorities arrested the LANDCOM Chief of Staff, Salih Sevil on July 20. The United Arab Emirates authorities detained the Commander of the Turkish Task Force for NATOs Resolute Support mission in Afghanistan, Major General Cahit Bakir, and the Commander of the Train, Advice, and Assist Command (TAAC) in Kabul, Brigadier General Sener Topuc, and handed them over to Turkish MIT on July 26, 2016. Bakir previously served as the Head of Turkish Air Force Intelligence until his deployment to Afghanistan in January 2015. Erdogan’s purge of the Turkish Air Force constituted ¼ of the total general officers/admirals purged in the first week after the coup attempt. Erdogan removed the commander of all nine Main Jet Base Group Commands, units that include combat air wings. The arrests included the Commander of the 10th Tanker Base Command at Incirlik Air Base, General Bekir Ercan Van, who requested American asylum prior to his arrest. American officials denied any involvement in the coup attempt, but the prominent role of the 10th Tanker Base has provoked popular demonstrations against the U.S. presence at Incirlik. A consolidation of command and control over Turkey’s combat air wings could position Erdogan to halt Turkey’s participation in anti-ISIS operations without meeting internal resistance. Erdogan’s purge of the Navy was less severe, but included two key commanders: Commander of the Black Sea Region, Rear Admiral Hasan Dogan, and Commander of the Dardanelles Straight, Rear Admiral Serdar Ahmet Gundogdu. The Black Sea Region and Dardanelles Straight are strategic regions for Turkey in its relationship with Russia. It is unclear whether both commanders participated in the coup attempt, but Erdogan likely seeks to install loyal leaders in these positions. This report does not examine detained military personnel at echelons below the general officer/admiral level or the additional personnel dishonorably discharged on July 28. Two unidentified generals in the Land Forces have also since resigned. The purge of these personnel is likely concentrated in key geographic areas where Erdogan seeks to solidify his control. Istanbul and Ankara are likely highly represented, along with Izmir, which hosts the 3rd Corps/NATO Rapid Reaction Force. Erdogan is reshaping Turkey’s foreign policy away from U.S. interests as he carries out his purge. Director of National Intelligence (DNI) James Clapper outlined the effect of Erdogan’s purge on July 29, stating “many of our interlocutors have been purged or arrested. There’s no question this is going to set back and make more difficult cooperation with the Turks.” Erdogan and loyal Turkish authorities have also fueled anti-U.S. rhetoric within Turkey. Erdogan created a narrative that the U.S. supported the coup attempt because of the asylum provided to Fetullah Gulen. Turkish officials and media outlets loyal to Erdogan have gone even further, stating that the US was directly behind the coup attempt. One outlet accused former US International Security Assistance Force (ISAF) Commander General John F. Campbell of orchestrating the coup attempt. The anti-American sentiment Erdogan is stoking during his purge may indicate that he is setting conditions for a pivot in Turkish foreign policy away from the U.S.
Erdogan is meanwhile pursuing a closer partnership with Russia. Turkey and Russia have revived talks over the Turkstream deal since the failed coup attempt, which would expand Russia’s access to the European gas market. Turkish authorities have also alleged that the Turkish pilot who shot down a Russian jet in November 2015 was a rogue FETO member, further distancing the Turkish government from the escalation. Former Turkish Prime Minister Ahmet Davutoglu contradicted the allegation, stating unequivocally “I gave the order.” Davutoglu’s statement suggests Erdogan is using the alleged FETO conspiracy to ease his rapprochement with Russian President Vladimir Putin. Erdogan is scheduled to meet with Putin on August 9th in St. Petersburg. Erdogan’s purge of Turkish commanders serving in NATO raises the question of whether he is considering leaving the alliance, perhaps to enter into a partnership with Russia. He is most likely to balance both relationships in the near term, but American policymakers must nonetheless brace for the new reality that America’s alliance with Turkey is not guaranteed. The leader of al Qaeda's Syrian affiliate, Jabhat al Nusra, announced the end of his group's operations and the creation of a new entity named Jabhat Fatah al Sham today. He claims that this new organization has "no affiliation to any external entity." The maneuver removes a key obstacle Jabhat al Nusra faced in Syria, namely the al Qaeda brand name, but it does not denote a change in the group's Salafi-jihadi ideology. Rather, the break will facilitate the unification of armed Syrian opposition groups around a core that still pursues al Qaeda's long-term objective of establishing an Islamic emirate in Syria. The cancellation of Jabhat al Nusra's operations and rebranding of Jabhat al Nusra fighters does not remove the group from the global Salafi-jihadi movement, which believes in the use of violence to establish shari'a-based governance. Jabhat al Nusra will continue to fight to advance Syrian Salafi-jihadi interests under its new name. It has not renounced its vision of establishing an Islamic emirate in Syria. It has instead improved its chances of success by removing obstacles to unify the opposition under its leadership. Syrian Salafi-jihadi groups want to unify opposition groups to increase the effectiveness of their war against the Assad regime. U.S. Director of National Intelligence James Clapper today noted that the formation of Jabhat Fatah al Sham likely aimed to "create the image of being more moderate in an attempt to unify and galvanize and appeal to other oppositionist (sic) groups in Syria." 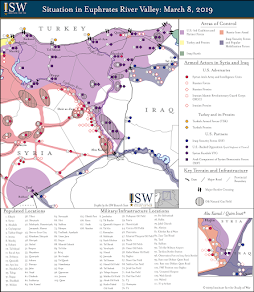 Jabhat al Nusra and Syrian Salafi-jihadi group Harakat Ahrar al Sham al Islamiya created a joint coordinating body with other opposition groups in northwestern Syria in March 2015 and seized most of Idlib Province from the regime. The success of the coordinating body, the so- called Army of Conquest, proved the value of deeper coordination within the opposition. The groups have been negotiating over a "grand merger" since. The decision to form Jabhat Fatah al Sham removes the primary source of the opposition's resistance to a merger. Opposition groups have been hesitant to merge with Jabhat al Nusra for fear that affiliation with an al Qaeda branch would justify Russia's air campaign and cause the U.S.-led coalition to target them. Russia claims to conduct counter-terrorism operations in Syria while using its air campaign to advance other objectives such as preserving the Assad regime. The U.S. is exploring a possible partnership with Moscow against Jabhat al Nusra, moreover. Today's announcement may be timed to disrupt the formation of this partnership. It was certainly part of a plan coordinated with al Qaeda's central leadership. Al Qaeda sanctioned the decision to form a new group in a message released today. This was no break from al Qaeda, but rather the execution of a deliberate global strategy on behalf of the movement. The al Qaeda statement emphasized that "the brotherhood of Islam that is between us is stronger than all the finite, ever-changing organizational links." Al Qaeda has never seen itself as having to direct, let alone brand, the global jihad. It aims, rather, to be the vehicle that unifies the ranks for the fight. Its founding members, including Osama bin Laden, believed that Islamists failed to achieve their objectives because they were disorganized and working at cross-purposes. Factionalism, according to al Qaeda, defeated the jihad. Al Qaeda, therefore, intentionally supports local Salafi-jihadi groups around the world and seeks to unify them over time. Some bear its name, others do not. Bin Laden instructed its affiliate in Somalia, al Shabaab, not to reveal its status, in fact, in order to protect it against Western attack. Al Shabaab's allegiance to al Qaeda only became public in February 2012, when bin Laden's successor, Ayman al Zawahiri, recognized the group as a formal affiliate. Jabhat al Nusra's split from al Qaeda should not affect the contours of the actual relationship. Al Qaeda has supported Jabhat al Nusra through the "Khorasan" cell, which provides strategic advice and guidance to Jabhat al Nusra's leaders. This linkage may persist. Jabhat al Nusra-under its new name-will also continue to cooperate with elements of the al Qaeda network in Syria, including the Turkistan Islamic Party. Salafi-jihadi groups and financiers would still see the Syrian jihad as the primary fight today, furthermore. They may even face fewer restrictions on providing support now that the group is not affiliated with al Qaeda. The split also does not prevent future realignment or mutual support between a unified opposition and al Qaeda. Al Qaeda has set a trap for the U.S. in Syria. Basing policy on the formal affiliation of a group to al Qaeda creates a major national security risk as al Qaeda and other organizations play these rules against us. American policymakers should instead make decisions based on the threat Salafi-jihadi actors pose using an understanding of their inherent ideology and objectives. By those measures, the new group remains a core part of the global Salafi-jihadi movement of which al Qaeda is the leader. It benefits from and strengthens that movement enormously. Its rebranding was tactically shrewd. If it befuddles the U.S. into believing that it is not a threat, it will have been brilliant. It is up to America's leaders to recognize it instead for the meaningless gesture it is. Russia enabled pro-regime forces to complete the physical encirclement of Aleppo City on July 28, isolating the primary nexus of the non-jihadist opposition in Northern Syria. These gains threaten the long-term survival of mainstream opposition groups that could serve as potential partners against ISIS and Syrian Al-Qaeda affiliate Jabhat al-Nusra. Russian warplanes continued to concentrate airstrikes against opposition targets on the northern and western outskirts of Aleppo City from July 14 - 27, allowing pro-regime forces to seize positions along the Castello Highway that serves as the only major ground line of communication (GLOC) into opposition-held districts in the eastern half of the city. Russian Minister of Defense Sergey Shoygu announced on July 28 that Russian President Vladimir Putin would authorize a “large-scale humanitarian operation” around Aleppo City in order to “help civilians…taken hostage by terrorists” while pro-regime forces opened a number of evacuation routes for the estimated 250,000 civilians that remain in Eastern Aleppo City. On the same day, Assad issued an offer of general amnesty for any opposition fighters that surrender to the regime within the next three months. The proposals regarding humanitarian support and national reconciliation, however, coincided with continued airstrikes against critical infrastructure and densely-populated urban terrain within Aleppo City, suggesting that Russia likely aims to depopulate Aleppo City in preparation for concerted pro-regime ground operations to force the surrender of opposition groups within the city. Russia also intensified its air operations in Eastern Homs Province in a likely attempt to preserve its legitimacy as a viable international partner in the Syrian Civil War. Russia concentrated its strikes on the eastern outskirts of Palmyra – a key crossroads town that provides the regime with a launching point for future operations into Eastern Syria. Russia invested significant resources into the operation to seize Palmyra in March 2016 and spun the victory as a triumph against terrorism that justified its narrative for intervention into the Syrian Civil War. Recent advances by ISIS near Palmyra have threatened to undermine this narrative. The Russian Ministry of Defense announced that it sortied six long-range strategic bombers from Russia to strike alleged ISIS targets near Palmyra on July 21, marking the second such sortie in the past month. The regime later deployed over 1,000 Iranian-backed Iraqi and Afghan Shi’a militia fighters to Palmyra on July 25 in order to reinforce the defenses of the city. Russia will likely continue to prioritize its campaign against ISIS in Eastern Homs Province in order to preempt its potential resurgence in the region and protect its claims to be a credible partner against violent extremism. Russia continues to wage its air campaign in a manner aimed at shaping the terms of a potential end-state to the Syrian Civil War in accordance with its strategic objectives. Putin has leveraged his role in the conflict in order to attract the U.S. into a one-sided partnership that will ultimately benefit Assad. On July 26, U.S. Secretary of State John Kerry stated that talks regarding potential cooperation with Russia in Syria against ISIS and Jabhat al-Nusra had been “making progress” and noted that final details could be announced as early as August 2016. The continued consideration of a bilateral deal despite the looming siege of Aleppo City will likely encourage Russia to continue its operations unchecked against large swaths of the mainstream opposition under the guise of counter-terrorism. Continued attacks against mainstream opposition groups will fuel further radicalization and consolidation under the leadership of jihadist groups. At the same time, Russia continued to promote itself as a constructive diplomatic actor by participating in a trilateral meeting with the U.S. and UN Special Envoy to Syria Staffan de Mistura on July 26 that urged a resumption of political negotiations. Russia will use its military influence to set conditions on the ground that force the U.S. into tacit acceptance of the long-term preservation of the regime. ISIS detonated a Suicide Vest (SVEST) in Kadhimiyah in northwestern Baghdad on July 24, and a Suicide Vehicle Borne-IED (SVBIED) at a checkpoint in Khalis, in Diyala Province, on July 25 in order to distract from anti-ISIS operations and undermine the Iraqi state. The spectacular attacks undermine the narrative that recapturing Fallujah would increase security for Baghdad. The attack at an entrance of Kadhimiyah, the seat of a major Shi’a shrine, also demonstrates ISIS’s continued capability to infiltrate secured areas of Baghdad, despite increased security after the Karrada attack on July 3. ISIS last carried out a successful attack in Kadhimiyah on May 11 at a checkpoint. The Iraqi Security Forces (ISF) cannot allocate additional manpower to Baghdad without detracting from ongoing operations in northern and western Iraq. Successful ISIS attacks will likely increase in Baghdad and its environs as the ISF contests remaining ISIS terrain in northern and western Iraq. Meanwhile, the Popular Mobilization inserted itself into slowed ISF operations in Qayyarah and Shirqat in order to set conditions for their participation in Mosul. Shi’a militias, including Sadrist Trend affiliated Saraya al-Salaam, Iranian-backed proxy militias, and those affiliated with the Islamic Supreme Council of Iraq (ISCI) moved forces towards Shirqat starting on July 19. The deployment follows the announcement that 560 U.S. forces will deploy to Qayyarah airbase, which Shi’a militias have condemned. The Popular Mobilization will also attempt to insert itself into northern operations in order to avoid being boxed out of operations in Mosul. The Coalition, Kurdish officials, and the Ninewa provincial government strongly advocated for a lack of militia involvement in northern Iraq out of fear of Shi’a-Sunni sectarian reprisals in terrain already contested between Sunni Arabs and Kurds. 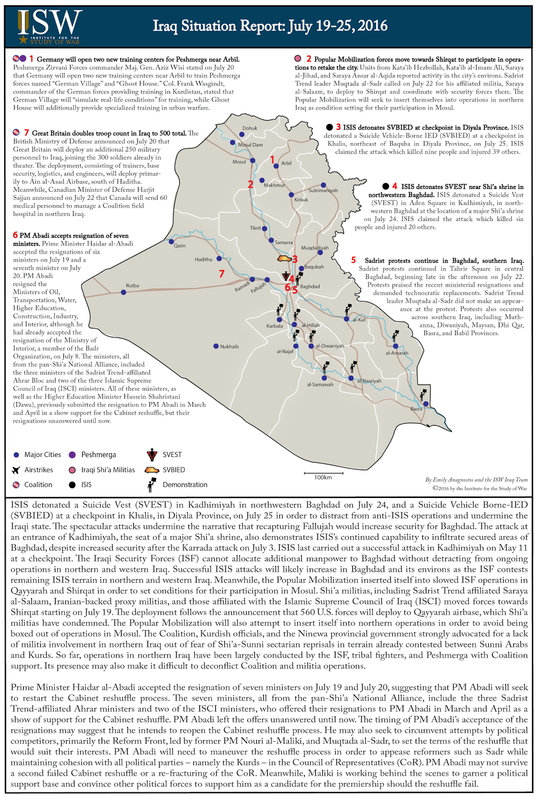 So far, operations in northern Iraq have been largely conducted by the ISF, tribal fighters, and Peshmerga with Coalition support. Its presence may also make it difficult to deconflict Coalition and militia operations. Prime Minister Haidar al-Abadi accepted the resignation of seven ministers on July 19 and July 20, suggesting that PM Abadi will seek to restart the Cabinet reshuffle process. The seven ministers, all from the pan-Shi’a National Alliance, include the three Sadrist Trend-affiliated Ahrar ministers and two of the ISCI ministers, who offered their resignations to PM Abadi in March and April as a show of support for the Cabinet reshuffle. PM Abadi left the offers unanswered until now. The timing of PM Abadi’s acceptance of the resignations may suggest that he intends to reopen the Cabinet reshuffle process. He may also seek to circumvent attempts by political competitors, primarily the Reform Front, led by former PM Nouri al-Maliki, and Muqtada al-Sadr, to set the terms of the reshuffle that would suit their interests. PM Abadi will need to maneuver the reshuffle process in order to appease reformers such as Sadr while maintaining cohesion with all political parties – namely the Kurds – in the Council of Representatives (CoR). PM Abadi may not survive a second failed Cabinet reshuffle or a re-fracturing of the CoR. Meanwhile, Maliki is working behind the scenes to garner a political support base and convince other political forces to support him as a candidate for the premiership should the reshuffle fail. This post represents the second in a series examining the implications of the failed coup in Turkey. President Erdogan has extended the State of Emergency for an additional three months and has begun purging the military as well as other sectors of Turkish society in the aftermath of the coup. This series will examine both the short- and long-term implications of likely actions by Erdogan beginning as they relate to Syria and Russia. Key Takeaway: The failed coup in Turkey has the potential to decrease U.S. influence in Syria and further divide NATO, and Russian President Vladimir Putin will engage Turkey to cement the divide. Turkey’s security crisis may interfere with NATO’s ability to maintain stores of nuclear weapons rumored to be hosted at Incirlik air base, which would grant Russia a symbolic and strategic advantage in reducing NATO’s deterrent capabilities. The attempted Turkish military coup on July 15, 2016 and subsequent purge of military and civilian positions by Turkish President Tayyip Erdogan will play into Russia’s hands. Russia aims to reduce U.S. influence in Syria and the broader Middle East and has recently been courting Turkey to drive a wedge between Turkey and its Western allies that will ultimately weaken NATO. After a period of tense relations following the shoot down of a Russian Su-24 jet by Turkish forces in November 2015, Turkey and Russia took steps towards a gradual rapproachment in June 2016. Turkish President Erdogan’s policies following the failed coup are likely to isolate Turkey from the EU and NATO allies. Russia will target Turkey during a time of military and diplomatic vulnerability to accelerate this outcome. Turkey, in its turn, has continued to mend its relations with Russia. Two Turkish pilots who downed the Russian jet in November 2015 were detained over links to the coup attempt. Turkish officials have also come out with the statement that the pilots had made the decision to shoot down the plane independently. The acceptance of this statement by both the Russian and Turkish sides allows for further reconciliation of this point, as well as the ability to identify a common enemy in ‘deviant’ Turkish military branches. Russian President Vladimir Putin and President Erdogan will meet during the first week of August and will most likely discuss cooperation in Syria. Russia may press for permission to use the NATO air base at Incirlik, although it is unlikely that Turkey would be allowed to grant Russia access as long as it remains in the alliance. However, this offer was previously alluded to and then retracted by Turkey in early July. Turkey and Russia could foreseeably reach a compromise regarding support for competing groups in Syria, with Russia agreeing to cease its public support for and alleged supply of weapons to Kurds in Turkey and Syria if Turkey uses its influence over select opposition groups to reduce fighting near Russian basing. Closer cooperation between Russia and Turkey in Syria would mean that the U.S. could no longer utilize Turkey’s firm stance on issues such as Assad’s removal and support for specific opposition groups to leverage its negotiations with Russia. [iii] The coup also has implications for Turkey’s willingness and ability to fulfill its role as a host of a component of NATO’s nuclear deterrent, which could be used by Russia to show a further division of the alliance. Turkey is rumored to be one of five NATO countries in Europe that hosts B-61 gravity bombs. These weapons are allegedly stored at Incirlik airbase. NATO operations were temporarily halted at Incirlik following the coup and the base was disconnected from commercial electric power supply until July 22. Turkish authorities arrested the commander of Incirlik airbase, General Bekir Ircan Van, who allegedly took part in the coup. Continued disruption of operations or doubts about the security of the purported weapons stores may limit Turkey’s reliability as a host for NATO’s nuclear deterrent in Europe. If these weapons were removed, Russia could foreseeably use this as evidence of Turkey’s shift towards Russia and away from the NATO alliance. 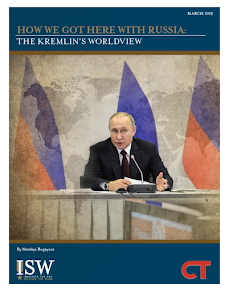 President Putin may use the narrative of guarding against a similar coup taking place in Russia to justify the intensification of ongoing efforts to attack political opposition and tighten control over Russia’s security apparatus. Two pieces of legislation, the “anti-terrorism” bill that was passed in June 2016 and the “foreign agents” law of 2012 provide Putin with substantial powers to track and prosecute potential enemies of his regime. The “anti-terrorism” legislation has not come into effect and only one criminal case has so far been opened under the “foreign agents” law. [iv] It is likely that Putin will begin utilizing these tools to attack political opponents and crack down if protests erupt leading up to the elections in Russia’s lower house of parliament on September 18. [v] The failed coup in Turkey will allow President Putin political leverage by which to tighten his control over Russia’s security apparatus. Putin has already undertaken measures to secure his position against a coup, including creating the National Guard force, which is commanded by Putin’s former bodyguard and responsible to the executive rather than the Ministry of Defense. Turkey’s coup will be used to justify further measures, such as wider application of the new surveillance legislation or expansion of executive powers, to secure Putin’s position against public resistance or a military uprising. It is unlikely that Turkey and Russia will pursue a long-term partnership as the two countries hold contradictory strategic interests. However, Russia may be able to use Turkey to accomplish short term goals, such as gaining more influence and international legitimacy for its intervention in Syria and driving a wedge between Turkey and its Western allies. As President Erdogan introduces increasingly authoritarian measures in the wake of the failed coup, EU members and NATO allies may increasingly reject Turkey as a partner. Russia can capitalize on Turkey’s isolation by drawing it further from these institutions in order to undermine their unity and reduce their efficacy in countering revanchist Russian policy in Europe and the Middle East. Labels: EU, European Union, NATO, Russia, Syria, Syrian Civil War, turkey, U.S.